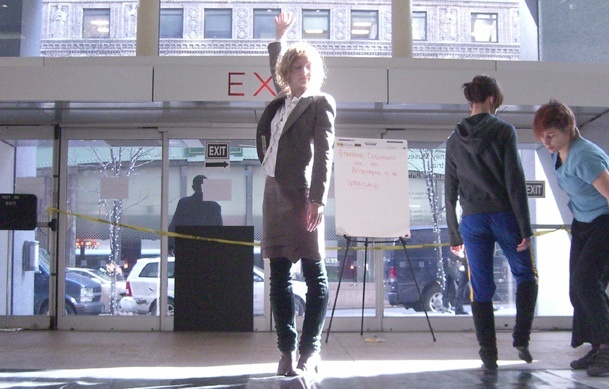 Performance Development for the Betterment of the Workplace (above), an improvisation workshop for office workers and others communicated through corporate speak which lends tools for expanding the experience of the workday through attention to repetitive movement present within it. 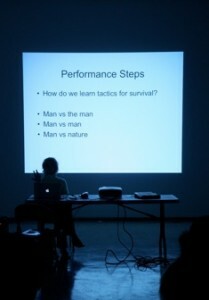 Performance Steps is a series of movements that can be taught to people of any experience level; existing survival tactics are taught from various sources already available to the public from U.S. Army Training manuals, hunter’s safety guides, legal choreography for civil disobedience, and what to do during a wild animal attack. 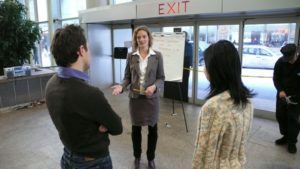 Other workshops may be more open-ended, aimed specifically for the context. 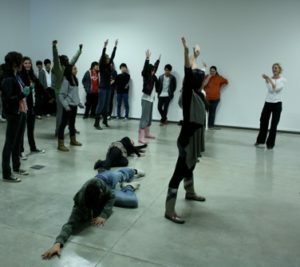 The activation of public space through movement, possibilities of transformation of experience through bodily awareness, and individual vs. communal movement experiments are broad themes that may be explored via different strategies. Workshop materials are built to meet the needs, interest and experience of the group whether visual artists, dancers, students or the general population. Please see Teaching page for long-term positions.